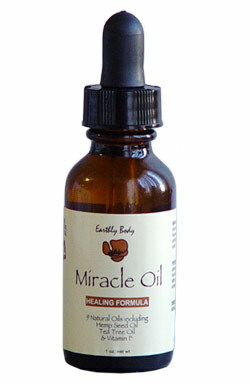 Earthly Body Miracle Oil - 1 oz. Earthly Body Miracle Oil is a miraculous combination of nine natural healing oils including tea tree, hemp seed, and vitamin E oils. Miracle Oil is an entire medicine cabinet in one bottle! Almost any skin condition imaginable! Plus it heals skin irritations, infections, plus much more.